Google Inc. launched their application online again just to help our fellow Filipino to find their family members or friends who were victimized by super typhoon Yolanda on November 8, 2013. Google Person Finder can be used by anyone without fee. It allows anyone to post and search for the status of family members or friends affected by Yolanda. This application has two main links: if you are looking for someone, just click the link in the left side with green background. Then if you have information to someone, just click the appropriate link for that. "You can also search with SMS by texting 2662999 (Globe), 4664999 (SMART), 22020999 (SUN), or +16508003977 with the message Search [name]. For example, to search for Joshua, text Search Joshua"
For the meantime, please bookmark this page now or visit this site more often for you to be updated. 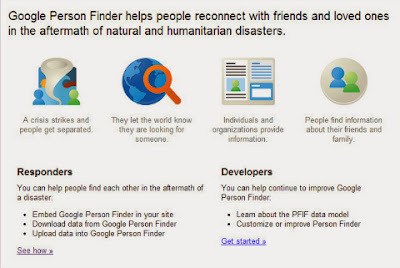 You may also share this post to your friends so they may know about Google Person Finder: Typhoon Yolanda . Comments or suggestions about "Google Person Finder: Super Typhoon Yolanda " is important to us, you may share it by using the comment box below.